The WHS JV Wrestlers will be hosting an invitational Saturday - action gets underway at 9AM. The FFA will have a potato bar with lots of different toppings from 11AM - 1PM. 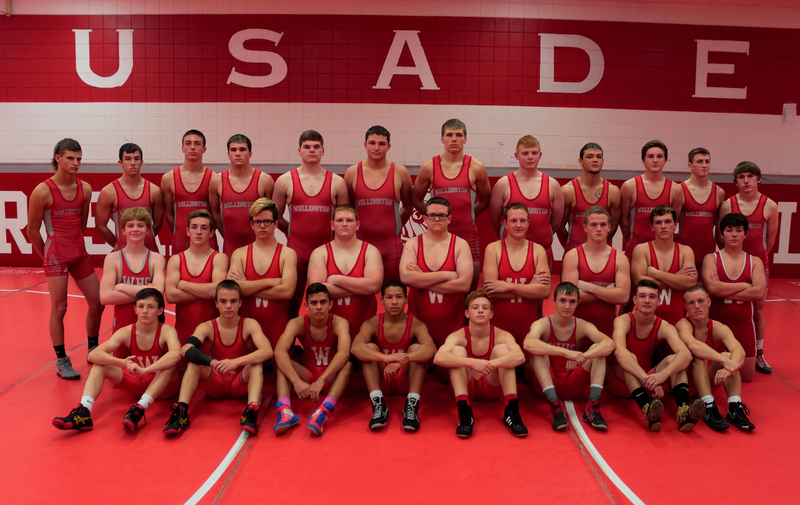 The CRUSADERS are at HOME (TUES) in dual action with PRATT…action gets underway at 5PM in the main gym – come out and support your Crusaders and Lady Crusaders!! AVCTL DIV IV LEAGUE HONORS were announced Monday evening - congratulations to the following "8" Crusaders who were honorably recognized for their 2017-2018 wrestling seasons! IAN GROOM - 195 lbs. MATT McCOMB - 220 lbs. QUINTON REDFORD - 132 lbs. ANDREW WOLF - 145 lbs. KANDEN YOUNG - 170 lbs. BRENNAN CANTRELL - 113 lbs. BLAKE BALES - 126 lbs. KADIN HEACOCK - 138 lbs. Groom lost to Smith of Columbus in a major decision 12-3 and finishes his Senior season at 36-9. McComb lost to Ebert of Andale, also in a major decision (9-1) and finishes his Senior season at 25-15. Congrats to both young men and also their senior teammate Blake Bales who's season ended Friday at 16-22. Their senior leadership will be missed next year for certain. Congrats on great seasons and HS careers for all 3 - GO BIG RED!! Blake Bales (16-22) place is unknown and scored 0.00 team points. Ian Groom (36-9) place is unknown and scored 3.00 team points. Matt McComb (25-15) place is unknown and scored 4.00 team points. Day 1 results find 2 of 3 Crusader 4A State Participants still in the hunt for hardware! Going into Saturday action, both Ian Groom and Matt McComb are just 2 wins away from medaling and can still finish as high as 3rd! Good Luck to both on Saturday. 195 lb. Ian Groom 36-8 will go up against Ridge Smith of Columbus 33-4. That winner will advance. 220 lb. Matt McComb 25-14 will go up against Jace Ebert of Andale 22-19 and that winner will advance as well. Groom and McComb are both 1-1 on the day in the double-elimination tournament. Teammate 126 lb. Blake Bales 16-22 fell to Roush of Holton and Totty of Burlington. This concludes Blake's HS wrestling career - we are proud of you - you went out in the TOP TOURNAMENT...congratulations!! Ian Groom (36-8) place is unknown and scored 3.00 team points. Matt McComb (25-14) place is unknown and scored 4.00 team points. Congratulations to SENIOR MATT MCCOMB (220 lbs.) for his 3rd place finish. Matt is 24-13 on the season and this will be his first trip to the State Tournament as a participant. Congratulations to SENIOR BLAKE BALES (126 lbs.) for his 4th place finish. Blake is 16-20 on the season and this will be his first trip as well to the State Tournament as a participant. Check out all of Wellington's results below - GOOD LUCK AT STATE IAN, MATT & BLAKE! Get 'er done!! The State 4A Tournament is in Salina next Friday and Saturday (Feb. 23rd / 24th) at the Tony's Pizza Events Center (formerly Bicentennial Center). Brennan Cantrell (6-5) place is unknown and scored 4.00 team points. Montana Heacock (10-17) place is unknown and scored 0.00 team points. Blake Bales (16-20) placed 4th and scored 11.00 team points. Quinton Redford (11-14) place is unknown and scored 1.00 team points. Kadin Heacock (22-16) place is unknown and scored 5.00 team points. Andrew Wolf (17-22) place is unknown and scored 6.00 team points. Kanden Young (27-16) place is unknown and scored 6.00 team points. Ian Groom (35-7) placed 2nd and scored 20.00 team points. Matt McComb (24-13) placed 3rd and scored 14.00 team points. Aaron Schoemann (13-8) place is unknown and scored 8.00 team points. WHS's Ian Groom (195) is STATE-BOUND! The Wellington Senior will wrestle for the Regional 4A Championship today! This will be Ian's 2nd consecutive trip to the State 4A Tournament in Salina! The other "9" WHS Wrestlers remain in the hunt! (Blake Bales, Matt McComb and Aaron Schoemann), all "3" just 1 win away from State 4A qualification! Read on! After Day 1, WHS as a team is in 8th place (out of 15 teams)with 43.0 score total. Arkansas City is in first with 208.0, followed by Andover Central 109.5 and Pratt 82.0. Action resumes at Ark City HS today at 10AM! GO BIG RED! Congratulations to IAN GROOM - STATE BOUND AGAIN!! McPherson beat Winfield 40-27 for the Division 3 Title. Individual Results 138 - Kadin Heacock 1-1 / defeated Winfield wrestler 182 - Peyton Smith went 1-1 / got his first varsity win that wasn't a forfeit against the McPherson kid 16-1. To celebrate his victory he wrestled the #2 ranked kid in 4A from Winfield. 195 - Ian Groom went 2- 0 / defeated the McPherson opponent 5-3. The McPherson opponent is ranked 5th in 4A and had beaten Ian at the Rose Hill tourney for 3rd and 4th. Ian is now 32-6. 220 - Matt McComb went 1-0 / didn't wrestle against Winfield, nursing an injury. 285 - Kyle Parsons went 1-1 / pinned his McPherson opponent, which was his first varsity win that wasn't a forfeit. So he got to wear the pin chain. Mikeah Rodriguez's place is 2nd and has scored 12.00 team points. Montana Heacock's place is 3rd and has scored 16.00 team points. Trystan Johnson's place is unknown and has scored 4.00 team points. James Hogg's place is unknown and has scored 2.00 team points. Peyton Smith's place is unknown and has scored 0.00 team points. Kenny Fehrman's place is 1st and has scored 26.00 team points. Jaylen Haris's place is unknown and has scored 0.00 team points. Nic Reyes's place is 3rd and has scored 3.00 team points. Devin Dickinson's place is unknown and has scored 0.00 team points. Logan Jones's place is 1st and has scored 20.00 team points. Kyle Parsons's place is 5th and has scored 0.00 team points. The WHS Wrestling squad was in action Saturday. WHS traveled to Andover HS - congrats to SR. IAN GROOM who went 4-0 on the day (195 lbs.) @ Andover for 1st!! SR. KADIN HEACOCK went 3-1 (138 lbs.) for 3rd and SR. MATT MCCOMB went 3-2 (220 lbs) for 3rd as well! Blake Bales, Andrew Wolf, Nic Reyes, and Kanden Young! Blake Bales (10-12) placed 5th and scored 1.00 team points. Kadin Heacock (11-10) placed 3rd and scored 18.00 team points. Andrew Wolf (12-10) placed 8th and scored 3.00 team points. Nic Reyes (5-6) placed 9th and scored 2.00 team points. Kanden Young (15-9) placed 7th and scored 8.00 team points. Ian Groom (27-4) placed 1st and scored 17.50 team points. Matt McComb (14-7) placed 3rd and scored 13.00 team points. Tuesday evening was the Wrestling Seniors last opportunity to wrestle on their home mat. The Seniors and their parents were recognized and honored before the dual with Newkirk began. Seniors included Blake Bales, Ian Groom, Jaylen Harris, Kadin Heacock, Logan Jones, Matt McComb, Austin Sears, Andrew Wolf and Manager Zoey Maxwell. The WHS Varsity and JV Wrestlers were on the road Tuesday at Andale HS in double dual action with Clearwater and Mulvane. Here are the outcomes from the Varsity matches. The Crusaders finished 2-2 in league action. Andale beat Mulvane 36-35. Mulvane beat Clearwater 54-18. Mulvane finished 2-2 in league. Andale is 2-0 and has Clearwater and Rose Hill left. If those 2 schools would beat Andale and Clearwater beat Rose Hill, there would be a 5 way tie for the league title. Chances of that happening though are not very likely. On Saturday, the WHS Varsity Wrestlers competed at the 17 team invitational in Rossville, which is located west of Topeka on I-70. (about 180 miles one-way from here)...overall results were good for the Crusaders. Senior Matt McComb shined on the day, going 2-1, falling only in the Championship match to Justin Schuman (Shawnee Mission East) in an 11-6 decision. Great Job Matt! Here is a complete overview of Wellington's results from Rossville! The Crusaders finished 9th out of 17 teams! Nightcap match with Mulvane ended in a 36-36 tie. Using established tie-breaker criteria, WHS was declared the winner. YAY! In other action, Mulvane downed Rose Hill 46-34 in their dual. So, overall, each team went 1-1, but Wellington won the double-dual overall 12-11! Great Job Crusaders! The Varsity boys head to Marion Friday, the JV boys head over to Rose Hill on Saturday for a JV Tournament there. The WHS Varsity Wrestlers hosted their annual invitational Saturday at WHS. 15 teams total and in the end the Wellington BOYS IN RED had fared quite well! As a team, finished 6th!! Congrats to Sophomore KANDEN YOUNG (170 lbs) - Kanden went 3-1 today, finishing SECOND!! Other teams in competition today were Andover, Arkansas City, Circle, Clearwater, El Dorado, Marion, Mulvane, Rose Hill, Salina Central, Wichita-East, Wichita Trinity Academy, Wichita-North, Wichita-West, Winfield. CONGRATULATIONS CRUSADERS ON A MIGHTY FINE DAY!! In JV action, Kenny Fehrman and Betrai Taylor both won by fall. Both the WHS Varsity and JV Wrestlers opened their 2017-2018 seasons on the road Saturday. (Dec. 2nd) The JV were in action at Winfield HS and the Varsity trekked a little further, about 100 miles to be exact, to Caney Valley HS, just this side of Coffeyville in SE Kansas. WHS finished 4th as a team with 107 pts! NOTE: Saturday, Dec. 9th, WHS hosts their BIG VARSITY INVITE @ WHS beginning @ 9AM - teams participating will include, Andover, Ark City, Circle, Clearwater, El Dorado, Marion, Mulvane, Rose Hill, Salina Central, Wichita East, Wichita Trinity, Wichita North, Wichita West and Winfield. WHS JR. AARON SCHOEMANN MEDALS @ State 4A Tournament! WHS Crusaders have completed their action at the State 4A Wrestling Tournament in Salina this weekend. Junior Aaron Schoemann is returning home with 5th Place hardware after going 4-2 over the 2 day event. No Crusader has won "4" matches at State since 2007 when Kody Page won the 215 lb. State Championship! Freshman Kanden Young and Junior Ian Groom were also in action on Friday, both ended up 0-2 but both battled hard and represented well! Congrats to all 3 - special congrats to Aaron - you are a medalist CRUSADER and still have 1 more year to go - dare to dream - all of you!! The Crusaders had "5" wrestlers competing at the annual 2 day/23 team Rose Hill Invitational this past Friday and Saturday. Congratulations to Jr. Aaron Schoemann who went 2-1 and finished 2nd after being defeated by Peters of Salina Central in the 182 lb. championship match. Schoemann lost by decision. Awesome job Aaron! 126 lb. Daniel Schmidt went 2-2, 132 lb. Kyle Clem 1-2, 138 lb. Andrew Wolf 1-2 and 220 lb. Matt McComb 1-2. 220 lb. MATT McCOMB SEALS THE DEAL! UPDATE: The Andale Varsity Wrestlers defeated Rose Hill Thursday evening 43-33. The Andale victory handed theAVCTL DIV IV LEAGUE CHAMPIONSHIP to the CRUSADERS! There was Double Dual wrestling action at Clearwater HS Thursday w/ host Clearwater, Andale and Mulvane. The Varsity Wellington Crusaders pulled out 2 league wins, downing Andale 72-10 and downing Clearwater 43-33. Andale is in a 2 day large invitational at Basehor-Linwood today and Saturday so they opted to send mainly JV wrestlers and "6" open weights to Clearwater thus the unusually lopsided outcome in the opener. Andale lost by a similar margin to Mulvane. In Wellington's 2nd dual Thursday, a close and competitive faceoff.In the end our Crusaders secured their 2nd win on the evening 43-33. Clearwater lead early on but the "mo" changed and the big red machine chalked up the 2 league victories in one night. Great Job Crusaders - Good Luck Saturday as they return to Clearwater for a 13 team invitational which will get underway at 9AM. Weather could be a concern however and Clearwater will make a decision today as to whether the Saturday tournament will be held or not. The Wellington Crusader Wrestling Team hosted Pratt Thursday in dual action out at WHS. In the end it was Pratt 59 Wellington 24 and the visitors (who are ranked #2 in State 4A) would win 10 of the 14 matches wrestled and 8 of those 10 by pin. Sounds bad perhaps but actually the Crusaders gave up just a couple of "quick" pins, most of the other matches were battles to varying degrees that swung the wrong way nearer to the end than the beginning. Congrats to 126 lb. Daniel Schmidt, 138 lb. Kadin Heacock and 220 lb. Matt McComb - all "3" pinned their Pratt opponents. Pratt was open at 170 lbs. giving Isaac Hilt that victory. Next up - Wellington Invitational (JV and Varsity) this Saturday at WHS - action gets underway in both gyms at or around 9AM. Thursday was MEDIA DAY at WHS / the 2016-17 Boys Basketball, Girls Basketball and Wrestling squads were in official game/match attire and the camera's clicked away. Here are most of the WRESTLING PICS!